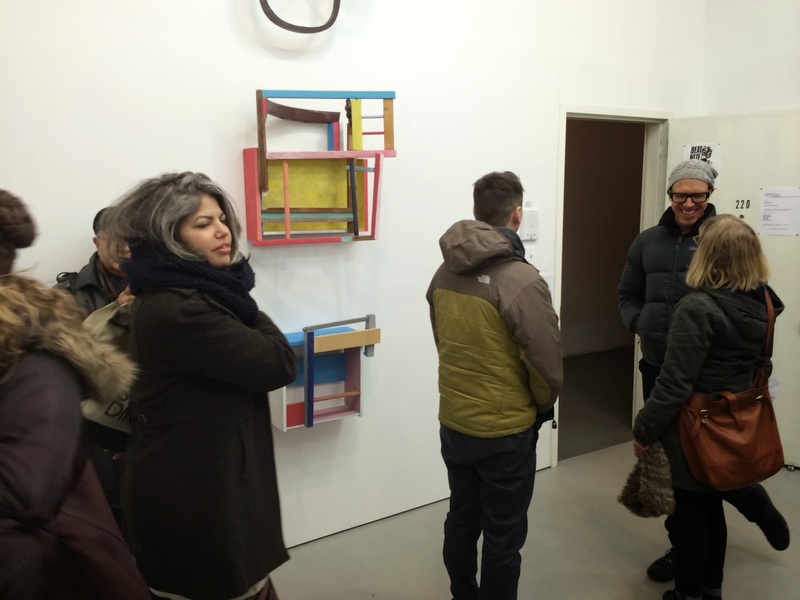 February 28th was the tenth semi-annual Beat Nite, an event in Bushwick and Ridgewood where about a dozen galleries stay open after hours. 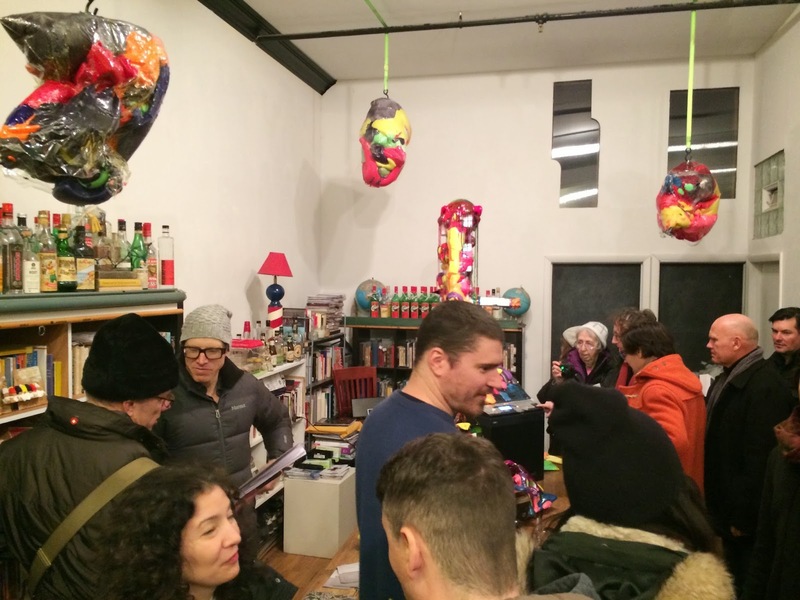 It's organized by the tirelessly enterprising Jason Andrew of Norte Maar, and the galleries that participated in this one were chosen by artist/gallerist Austin Thomas of Pocket Utopia Gallery. It was cold, and the galleries were spread out over a large area, so ordinarily I would have only gone to about half of them. Fortunately I was lucky enough to be offered a seat on a bus that made the rounds of all the galleries. And touring around with a group was a nice way to meet some interesting people. Valentine Gallery – The paintings are by Patricia Satterlee. She's in the center wearing a red scarf. This was a perfect jewel of a show not only because the art was good, but the work of each artist played off of, and illuminated, the work of the others. 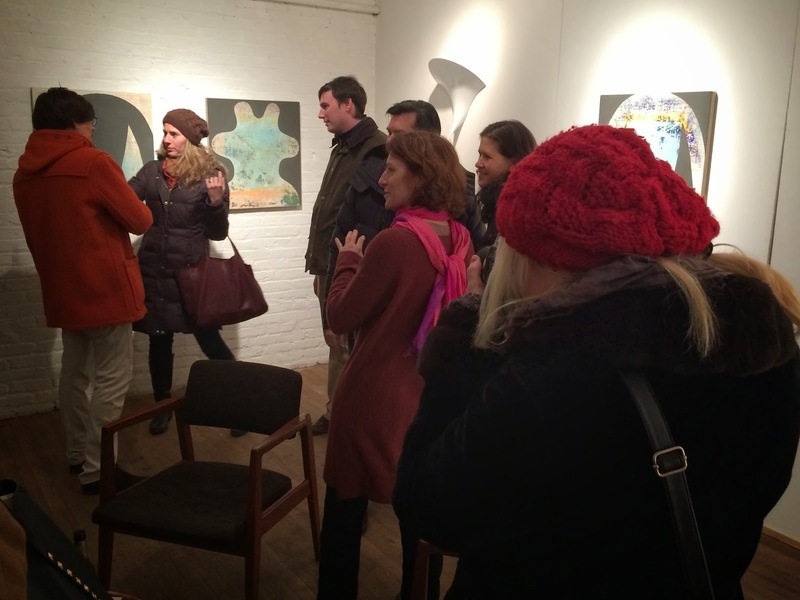 The artists in the show were David Henderson, Jude Tallichet, and Patricia Satterlee (one of my favorite painters). Unfortunately the show closed March 9th. Parallel Art Space has had a Jersey City connection. 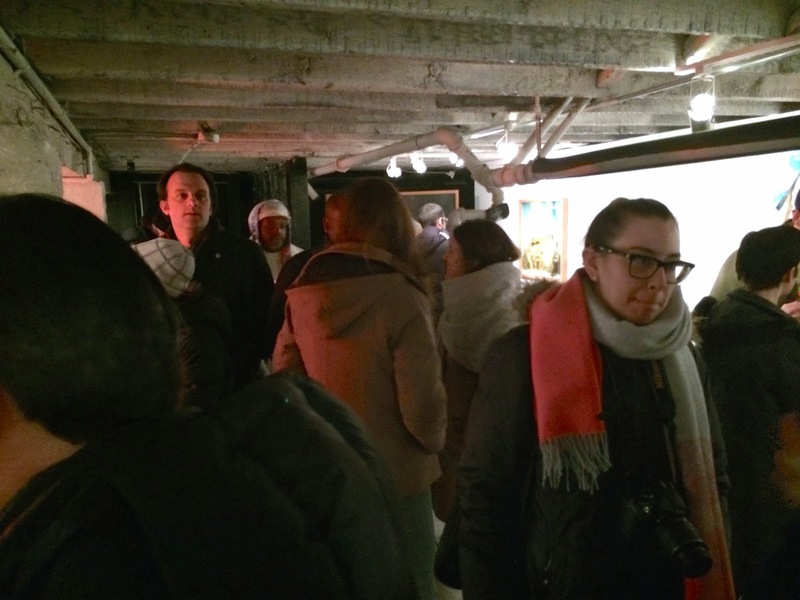 They collaborated on an exhibition with Jersey City's excellent Curious Matter Gallery, and the director of Parallel, Enrico Gomez, has attended Jersey City art openings; in fact I had a genial conversation with him last week at a JC Fridays event. Parallel Art Space – reliefs by Kim Tram. Airplane is a basement space with a back yard where sculpture is sometimes exhibited. They are finally getting some attention for their consistently excellent shows. Signal usually exhibits monumental sculptures, wall murals and large paintings. 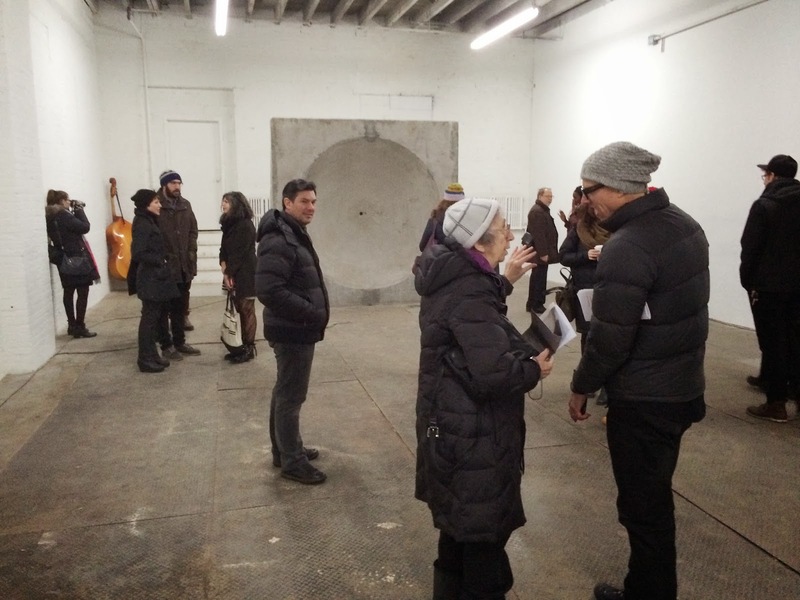 The concrete parabolic sculpture in the back (called a "sound mirror") focuses and amplifies ambient sounds, and a microphone in the center picks up and alters the sound, creating a feedback loop. Tim Bruniges – Mirrors, Signal Gallery. In the foreground, Julie Martin, the director of E.A.T. (Experiments in Art and Technology) is talking to Jason Andrew, the director of Norte Maar. Centotto is a small apartment gallery run by the brilliant poet/artist and Doctor of Italian Literature, Paul D'Agostino. Most of Centotto's exhibitions have an evening or two devoted to discussions about the work. Work by Ben Godward at Centotto Gallery. English Kills is known not only for the consistently first-rate work they exhibit, but also for the congenial BBQs and pot lucks they do in their side yard. 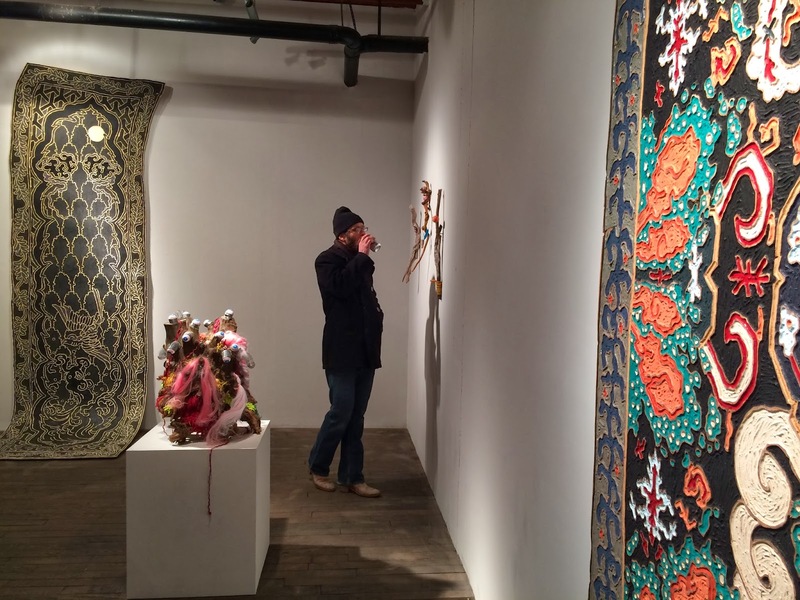 Brent Owens, to his credit, created a wide range of painted wood sculptures and reliefs (yes, the work that looks like hanging carpets in this photo is carved and painted wood). People loved this work – Owens is an artist to watch. Brent Owens, For Thinkin' Long and Dark, English Kills Gallery. This was the fourth Beat Nite I've been to, and if you haven't gone yet, I highly recommend you go to the next one if you can. To be notified of future Beat Nites and other worthwhile events, subscribe to Norte Maar's newsletter here. I adored BeatNite! To be honest - I felt the few galleries I did see gave me abetter viewing experience than most of my trips to the LES = X !